Vaccinations are essential to protect your dog from a variety of potentially fatal viral diseases and bacteria. All dogs should be vaccinated against Distemper, Hepatitis, Parvovirus, Parainfluenza virus, Leptospirosis and Bordatella. Dogs should be vaccinated at 6-8 weeks of age, 10-12 weeks and 14-16 weeks of age, annually thereafter. These diseases can have lasting harmful effects on your dog and in some cases, they will cause death. Treatment is often expensive, difficult and the recovery rates are low. Vaccination is the best protection you can offer your pet. Annual health checks are strongly recommended to ensure your dog has a long and healthy life. Worms are a common problem in dogs, with some leaving nasty effects on your pet’s health if left untreated. In puppies, these effects can be fatal. The major intestinal worms affecting dogs are roundworm, hookworm, whipworm and tapeworm. Heartworm is a serious parasite that once established causes damage to your dog’s heart and lungs. Heartworm is transmitted via a mosquito bite so all dogs are at risk. Prevention is better then cure in this situation. The preventive programs should start as early as six weeks and it’s important to continue prevention throughout your dog’s life. Preventative medication is available as a long acting injection which can be given alongside your dogs vaccinations. Dog require this vaccination at 12 weeks old, 6 months and annually thereafter. There are also other treatment options available such as monthly tablets and a monthly liquid spot. Unless you are serious about breeding, then all dogs, both male and female should be de-sexed at 5-6 months of age. As well as preventing unwanted litters de-sexing has many benefits at this age including being more cost effective for you! As a pet owner, you are responsible for your pet’s behaviour. Puppy obedience training should begin at an early age. 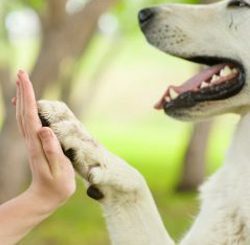 The best time for socialisation, handling and training of your pet is between 6- 16 weeks of age. Socialisation means introducing your puppy to other dog’s and people in a controlled environment. Pups that are not socialised, will often develop aggression, fear and other behavioural problems. Puppy preschool is strongly advised and is a great chance for your puppy to gain social skills and for you to learn all the important aspects of puppy care. Please ask our friendly staff or call us on 4959 2099. Finding the optimum nutritional balance is difficult with home- made diets. To ensure the development of healthy muscles, bones and organs, it is important that your puppy is fed a balanced, nutritional diet. We recommend Advance premium dry foods, as there is no need to supplement. Please ask your veterinarian/ veterinary nurse for a product to meet the special nutritional requirements of your puppy. From birth until three – four weeks of age, mother’s milk should satisfy all the nutritional needs for your puppy. After this time however, puppies will begin to take an interest in other foods. Growing puppies have a large demand for nutrients, especially when they are small, so it is important that their first solid foods are highly palatable, easy to eat and supply a complete and balanced nutrition. Dogs require high levels of animal protein and some animal fats in their diet. Puppies should be fed 3 to 6 times per day, while adult dogs need only 1 to 2 meals per day. You also should make sure your pet has a constant supply of clean drinking water. Ticks are an extremely serious problem in our area. They are carried by native animals, especially possums and bandicoots. Call our friendly staff today to find out about the best prevention for ticks for your dog. How can a four- letter word cause so many problems? EASY! They can cause irritation, skin allergies and anaemia, just to name a few. Good flea control requires an integrated approach, killing the adult flea and breaking their breeding cycle within the environment. There are many effective products on the market designed to control fleas on your dog. Call out staff to find out about the best control for your dog. Micro-chipping is now compulsory for all new puppies and kittens between the age of 8-12 weeks of age. It is also compulsory for any animals that have a change of owners. Microchips are a safe and permanent mode of identification that cannot be removed or lost. They are the size of a grain of rice and are inserted under the skin between the shoulder blades. All council pounds and veterinary surgeries are equipped with a scanner that can detect the microchip number. Your pet’s details are recorded in a central animal register and can be accessed by councils and surgeries in order to locate you, the owner. In the event your pet leaves home without you for whatever reason, the chances of a safe return are greatly increased. Once your pet is covered, you have the peace of mind knowing that should your pet fall ill or be injured, you have the financial support to help you afford the treatment your pet needs. Hate struggling with your pet to clip its nails. Leave it to our trained nurses who are happy to perform this sometimes difficult task at no cost (a sedation fee may be applicable in some cases). Our qualified nurses are also available to give medications, should you have difficulty at home.